Posted By:Unknown | At:5:28 AM Be the first to comment! Starting from our Sun, join two planets together and reach the far end of our solar system, to our beloved planet Pluto! 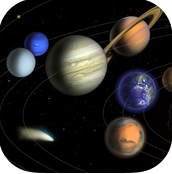 Swipe horizontally and vertically to move the planets and explore our solar system. See your journey route with planet thumbnails. Share your score with your friends and family! Very easy to play try it right now!